Engineers in the USA have created an ice-repelling material for aerospace applications using a new physical concept called stress localization. The team from the University of Houston has already developed a sprayable, durable silicone polymer coating capable of repelling ice from any surface. They plan to use the concept to tune and predict the properties of materials that could be used in other aerospace applications. Hadi Ghasemi, the Bill D. Cook assistant professor of mechanical engineering at the University of Houston, said that the research suggests a way to take trial and error out of the search for new materials, in keeping with the movement of materials science toward a physics-driven approach. He added that the concept can also be used to predict materials with super antibacterial or other desirable properties. Ghasemi has previously developed several icephobic materials, but these had not been able to completely overcome the problem of ice adhering to the surface and had mechanical and environmental durability issues. The new understanding of stress localization enables the silicon polymer coating to avoid those problems, he said. The new material uses elastic energy localization where ice meets the material, triggering cracks at the interface that slough off the ice. It requires minimal force to cause the cracks; the flow of air over the surface of an aircraft acts as a trigger, for example. Testing has showed that the material is mechanically durable and unaffected by ultraviolet rays, an important characteristic for aircraft which face constant sun exposure. It also does not change the aircraft’s aerodynamic performance and will last for more than 10 years, with no need to reapply. 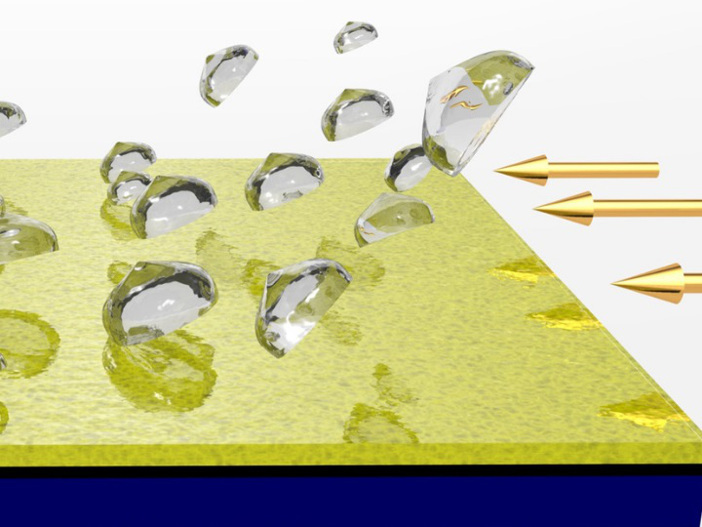 The research, “Stress-Localized Durable Icephobic Surfaces” was published in the journal Materials Horizons this month.